A small sample of our finds! A few are already wire wrapped for pendants. The large, very dark green piece at the top, still stands up. 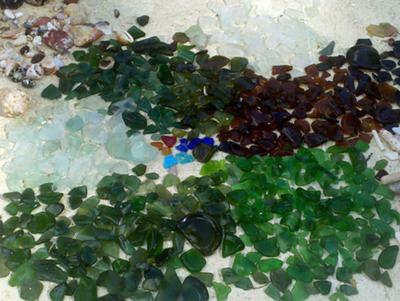 Definitely an excellent beach to find sea glass if you can find it. Most of the resorts, cities, and entertainment are on the west side so the east side facing the Atlantic is rather undeveloped. We were on the west side of the island and had to take a really narrow, windy, rocky road that is not well marked. Once over to the east side, the road drops to about a 70 degree grade down to the ocean. Trust me, you will get lost. In the off season, a taxi will take you over for about $30 Barbados, but a rental car will allow you more freedom to collect to your heart's content. The area is "Congor Rocks" (see map below). The beach is very rocky and slick! The island is made up of limestone which is impossibly slick when wet. 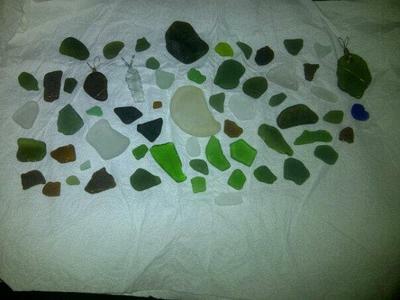 My mother busted her elbow which cut our sea glass hunt short so be careful. Brown and green are the most common as the local made rum is in brown and green bottles. However, the suprising finds were several black and one really deep blue. The beach is covered with glass and each wave brings more. There were tons more, but needed to get my mother medical attention. Low and mid tide are the best times. The east side becomes very dangerous during high tide and swimming is never allowed. You may occasionally see a surfer and small fishing boats, but that's all. Look for a small local rum shack and the beach will be directly across from it. Beach at Bottom Bay, Barbados, Caribbean I went in january to Barbados, I was staying in the south side. Although rated excellent, most of the pieces shown are not jewelry grade. Beach was not given a standard rating (stating number of jewelry-grade pieces found per hour).